This Fool's Square quilt block pattern is half the size of the traditional 10" block we normally see for the design -- a petite scale that makes the pattern suitable for a wallhanging or a baby quilt. Fool's Square is similar to other star-motif quilt blocks. Some are actually identical but known by different names because their patchwork is designed with varying placements of color value (contrast). Choose three fabrics for each Fool's Square. Sew with an accurate quarter inch seam allowance, because even small variations can throw off the dimensions of small blocks. Block corners are made from half square triangle units. The cutting chart below lists the correct size required to make units for the small block, but consider using slightly larger squares and then cutting your units back to the exact size after assembly. When you trim-back, use a square ruler with a diagonal line from corner to corner (like Martingale's Bias Square). Align the diagonal line with the unit's diagonal seam, trimming two adjacent sides at once to the correct unfinished size (in this case 1-1/2" square) and making sure each represents exactly half of the unit. Repeat to make two more identical half square triangle units from remaining 1-7/8" squares. Gather one 1-1/2" x 3-1/2" pink print bar and two 1-1/2" x 1-1/2" dark pink squares. Use the quick flying geese method to sew pink squares to each end of the bar, trimming a portion away to create the triangles. Be sure to orient seams as shown in the illustration on this page. Repeat to make three more identical units. 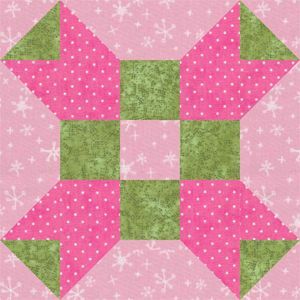 Create the block's nine-patch center by arranging four dark pink squares, one pink print square and four green squares (all are 1-1/2" x 1-1/2") into three rows as shown. Sew squares in each row together. Press seam allowances towards green squares. Join the rows, matching seams carefully. Arrange components into three rows as shown. Sew components in each row together. Take care, especially with the narrow top and bottom rows, which will likely have a tendency to stretch. Press seam allowances in the tall center section towards the nine-patch unit; sew seam allowances in top and bottom rows towards the outer units. Join rows, matching seams carefully. The quilt block should measure 5-1/2" x 5-1/2" square. If it doesn't, see How to Fix Problem Quilt Blocks for ways to square it up.